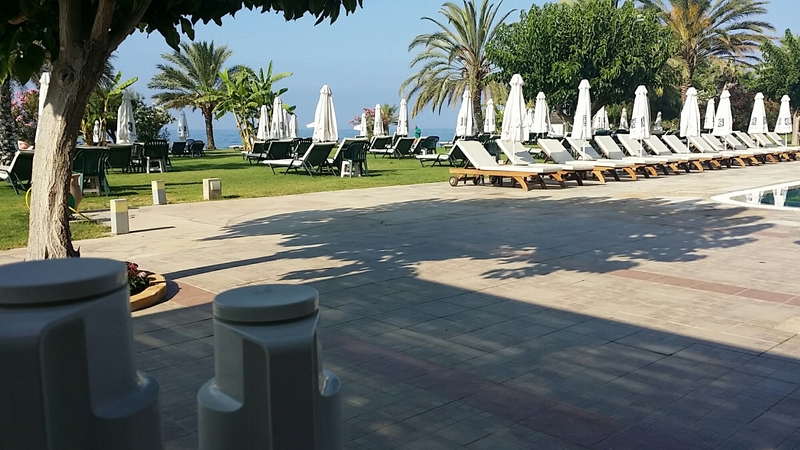 We stayed at the Athena Royal hotel for 4 nights during our 8 days holiday in Cyprus. The hotel is amazingly arranged with bars, restaurants, 2 outdoor pools and one indoor pool, spa, mini market and a wide garden where sun beds are available for the guests. Upon our arrival, we noted there is no doorman to welcome you in or take care of your luggage. A service that we found in almost every hotel we stayed in around the world (with the exception of Milan and Rome in Italy). The reception personnel were of the utmost friendliness and extremely helpful. Our check in and check out went through without any kind of trouble. We were assigned to room 3342, a partial sea view room, very nice and comfortable and with a little balcony available. In the room we found some balloons, a card wishing happy birthday to my partner (it was her birthday that day) some wine and complementary fruit, a kind touch from the management that we appreciated. We had a tv, an espresso machine with complimentary capsules and some tea bags. The toilet was alright with enough toiletries (shampoo, body lotion, soap, liquid hand soap) but without hair conditioner, shaving kit, tooth-brush and tooth-paste, hence you might want to bring them with you. The room was cleaned daily and some consumables replenished with the exception of coffee capsules and water. Just note that the service starts very early in the morning (before 8 am) and you might be waken up if you plan to sleep some more. Wi-Fi coverage in our room was fair or absent inside and decent on the balcony. However, room 3342 and the adjacent ones, are located very close to what seemed to be the kitchen and a continuous noise of cutleries and dishes being moved and thrown can spoil your tranquil moment in the evening. The hotel targets adults only, hence there are no kids around, making the place very quiet and relaxing. However, the majority of the guests (let’s say 90% of them) are very mature couples and with it I mean pensioners above 60. For a young couple, then, it might be awkward and sometimes boring to be in such an atmosphere. The hotel provides an efficient tourist support, with different representatives coming regularly to propose and book events in town or outside either by boat or bus. We took advantage of the service to book a cruise with Paphos Sea Cruises while we explored the city by ourselves. There are many restaurants available and bars to calm down the thirst during the day. They all serve decent food and good cocktails and the prices are very reasonable. One very positive point of this hotel is that they do not try to cheat you charging a ridiculous amount for drinks and food at the pool/beach/shop. Other than the pool side, the hotel offers a nice garden where the majority of the sun beds are located. The beach, instead, is very poor and consists in few meters of sand with wild vegetation and rocks. Not really the best if you look for a sandy beach and easy access to the water. Regular events are organized like live music, special night events and cinema nights. We participated to some of them but we realized that we were not the targeted audience and hence felt a bit bored. The other guests were, on the other hand, pleased by the proposed activities and enjoyed them very much. Breakfast wasn’t as good as we expected even though the variety of food available was great. There are eggs, bacon, sausages, cheeses, yoghurt, pastries and pancakes, fruits, coffee, milk and juices. We just found that bread, pastries and other products weren’t always freshly made but displayed until consumed. We had bad experience with the croissants, cereals and bread that tasted old and were tough. We had also an omelette prepared by the chef and did not like it because it was prepared superficially with ingredients not completely cooked and mixed properly. My omelette was without salt, my partner’s one was salty and both were very oily. While waiting for the omelette we noticed that fried eggs, pork bacon, pancakes and French toast were cooked in the same place. Not really the right way to do it. The breakfast is served in a very lovely location, by the pool or indoor as the guest prefers. 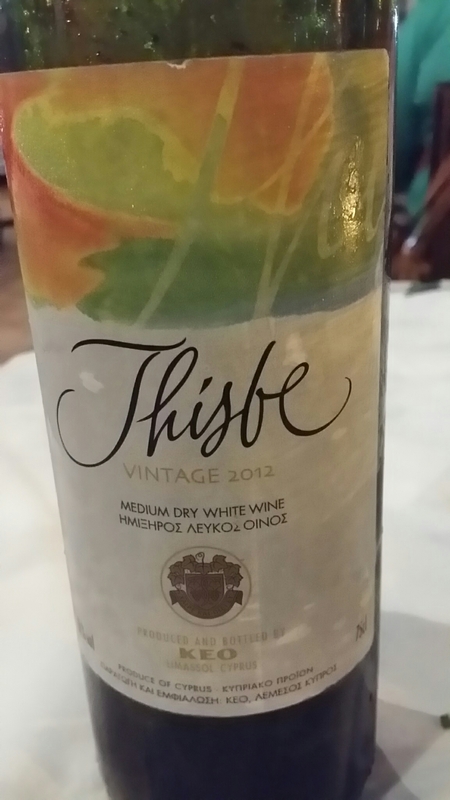 We enjoyed lunch at the Olive Tree restaurant few times and found it all right. We had a chicken gyros, hallomi sandwich and a salad and found them ok. The service quality is just ok. There are a lot of young staff with seasonal jobs working in this hotel. Some of them, like the lovely front desk operator who worked in Abu Dhabi before, were super efficient and friendly. Others were apparently less trained but still suitable for the role. We understood from some guests that a significant percentage of them (above 30%) spend their annual summer holiday in this hotel, someone since 10 years or more!!! For this reason, at the moment of checking out, we were granted a loyalty membership card that will allow us to get discounts from our next stay (if any) in the same hotel or hotel chain in Paphos. In conclusion, we enjoyed the stay at the hotel, however, probably not as much as the elderly guests do. 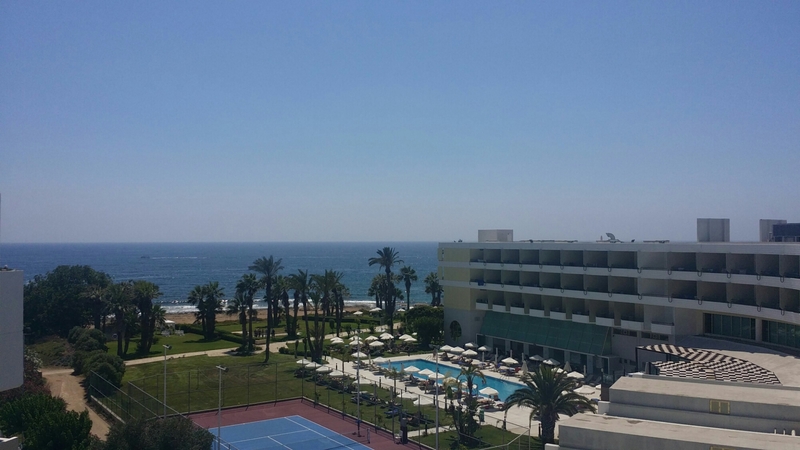 This entry was posted in Cyprus, Holiday, Hotel Review, Review, Travel and tagged beach hotel, Cyprus, holiday, hotel, Paphos on July 11, 2015 by andreadetto. 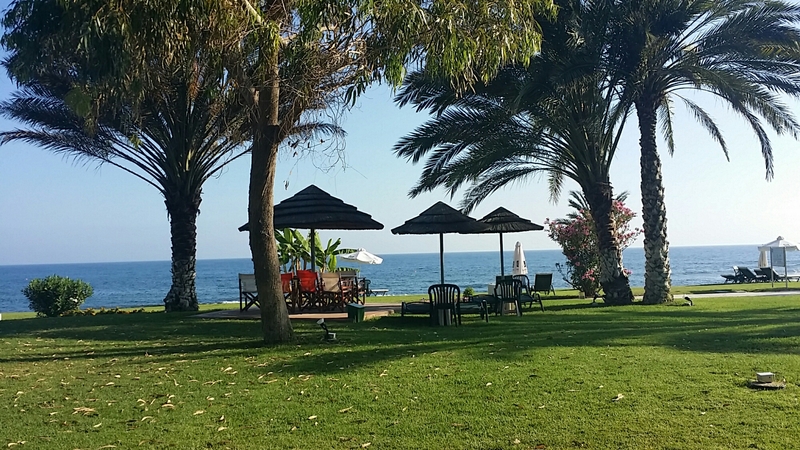 It was our last day in Paphos before moving to Limassol where we ended our holiday in Cyprus. We enjoyed the UNESCO world heritage site and decided to explore the beautiful west coast of the island by cruising from Paphos up north to Coral Bay, Lara Bay and Akamas Peninsula. We got various brochures and informations from the numerous kiosks present at the Marina and asked our hotel’s tour operator to arrange the booking for us. Among the various options, we opted for a full day sea cruise offered by Paphos Sea Cruises that promised to have beautiful scenery of the coastline, Coral Bay, the Sea Caves, St. Georges Island, Lara Bay (Turtle Beach) in its itinerary with, pick-up/drop off at hotel, open bar, lunch and seasonal fruits included in the price. The next morning we were timely picked up by a bus rented from a wedding celebration company. Once arrived at the harbour we were welcomed on-board of the Sea Star boat and let free to choose our favorite spot. Unfortunately, there were very limited sun bed available that were taken in few seconds by the first comers. We managed to secure a seat on the deck eventually; others were forced to stay inside or close to the anchor mechanism. Soon after the cruise started, the captain informed us that the weather was getting bad, hence the sea rough and therefore he decided to turn the boat eastwards for safety reasons. He assured that the B plan was entertaining and exciting as the original one. Unfortunately, it wasn’t. Instead of exploring a good deal of coast, we managed to navigate a few miles and have a swim in a perfectly useless bay close to our hotel!!! Definitely not the same value nor excitement as promised. During the cruise music and live singing entertainments were provided. However, since the majority of the tourists were Russian, the live songs performed were pure Russian music!! I am in Cyprus and would expect to hear Greek music or party music or chill out music during a cruise, certainly not Russians hits. The cruise offered the possibility to have two swim stops and to enjoy free snorkelling gears and canoes. For the snorkelling gears, they were completely useless since the Timis Bay where we stopped, had just sand to admire. Moreover, with more than 50 passengers, there were just 2 canoes!!! Finally it came the time to enjoy lunch. Bread, salad, butter, jacket potato, boiled vegetables, boiled rice, pasta with tomato sauce and grilled chicken. Just one piece of grilled chicken. The pasta was something outrageous, at least for an Italian. The rest was just ok even though I was expecting something different in light of the previous experiences we have done around the world. The boat had tables enough to accommodate 20 people only, the others had to eat somewhere else. At 2 pm circa, we were offered bananas and watermelon. Very tasty and appreciated under the sun. I guess if the weather was good and the cruise went the “right” direction, we would have enjoyed it much more, notwithstanding the Russian songs and the very fair lunch. Definitely, Russian speaking people had enjoyed the cruise more than we did. I would have personally preferred to be dropped at the harbour and refund some money, leaving us upset with the weather but not felling cheated by the organizers. 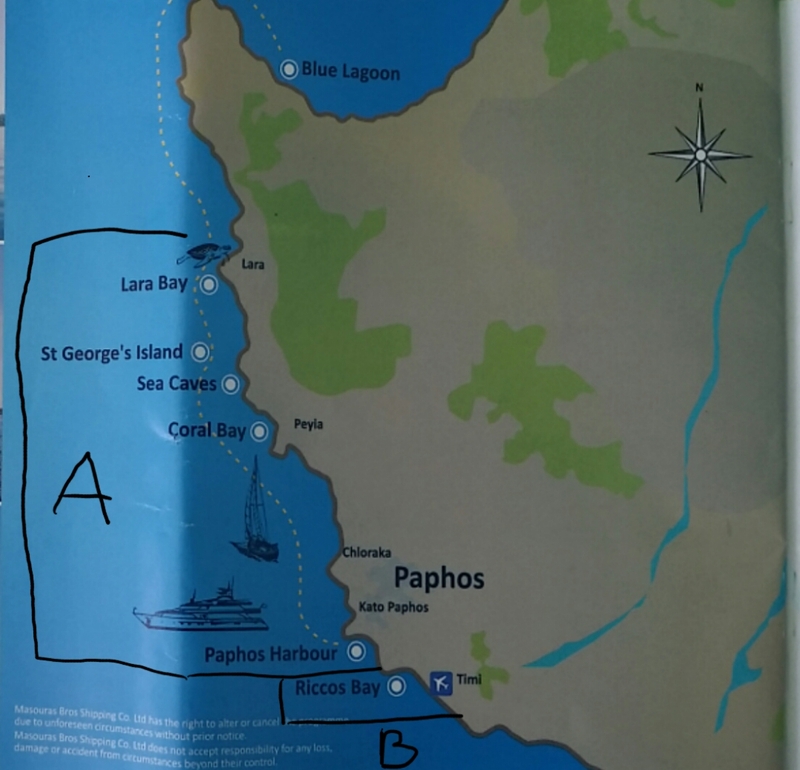 This entry was posted in Adventure, Beach, Cyprus, Holiday, Review, Scams & Warnings, Travel and tagged Cruise, Cyprus, Hot Season, Paphos, review, Sea Cruise, travel on July 11, 2015 by andreadetto. 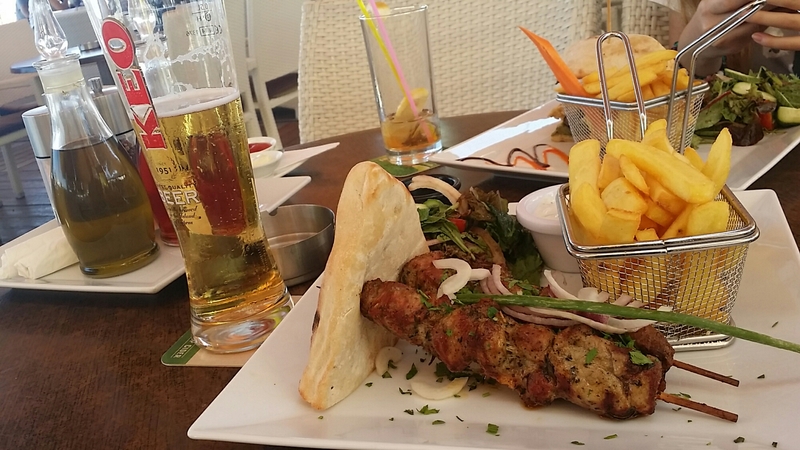 We stopped at Crocodile Bar one afternoon for a quick snack, since we skept lunch during our tour of Paphos city. The pub was almost empty because at 4pm most of the people were still at the beach enjoying the wanderful sun Cyprus has to offer. We were welcomed with a smile by a waiter and decided to have a quick pork kebab as late lunch. When we ordered, the waiter complained with our choise saying that the pork kebab was too heavy for that hour of the day and insisted to have us changing it with a chicke kebab. My partner accepted the proposal but I confirmed my order. After a while, the guy came back with our dishes: some meat chuncks, pita bread, very little salad and a big portion of fries. As I said, I did not particularly enjoyed the pork cubes and my partner did not like much even the chicken ones. They were just ok to calm our appetite we thought. That night we missed lunch and the day after we had a very light breakfast. Something in that meal was heavy to digest, maybe the fries or the meat itself. Prices are in line with the competitors. 2 kebab, water and beer cost something like 23 Euro for 2 people. This entry was posted in Cyprus, Food, Holiday, Restaurant, Restaurant Review and tagged Cyprus, Food, food lovers, Foodaholic, Kebab, Paphos on July 8, 2015 by andreadetto. 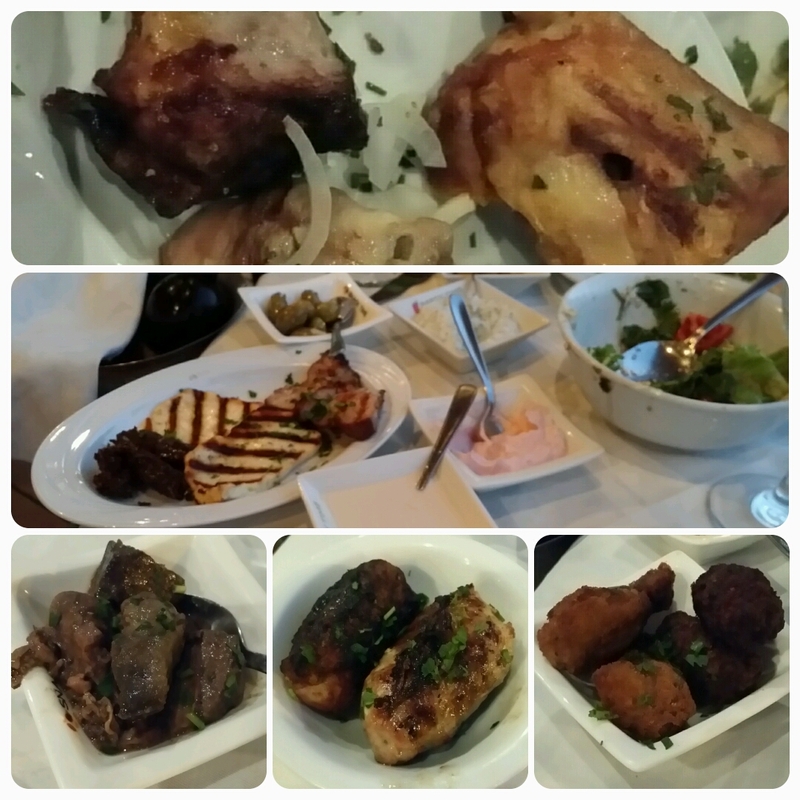 During our stay in Paphos we tried different Cypriot food in different restaurants. We noticed that Sunday evening many restaurant are closed and that english pubs and italian restaurants are more numerous than greek/cypriots taverns. Yesterday we found only one Cypriot restaurant open: Romeo’s Tavern. We were welcomed by the owner of the restaurant and promptly seated next to the window. The service was fair: one waitress was rude and the other one, even though more friendly and mannered, did not have a ‘five star’ training. We wanted to try some local “meze” (little portions of food to share) and a new white wine. The meze are enough for two hungry people since you will receive 16 to 18 different things to taste. We were starving and ordered also a starter and it was a bad idea because then we struggled to finish the ‘meze’. In fact, the small portions of food included pickled celery, olives, grilled halloumi, tzatziki souce, tashi (tahini and garlic dip), greek salad, beetroot, lountza (smoked pork grilled), grilled and fried chicken, pork souvlaki, chicken liver and other different kinds of sausages with different spices like cumin for instance. And pita bread of course. 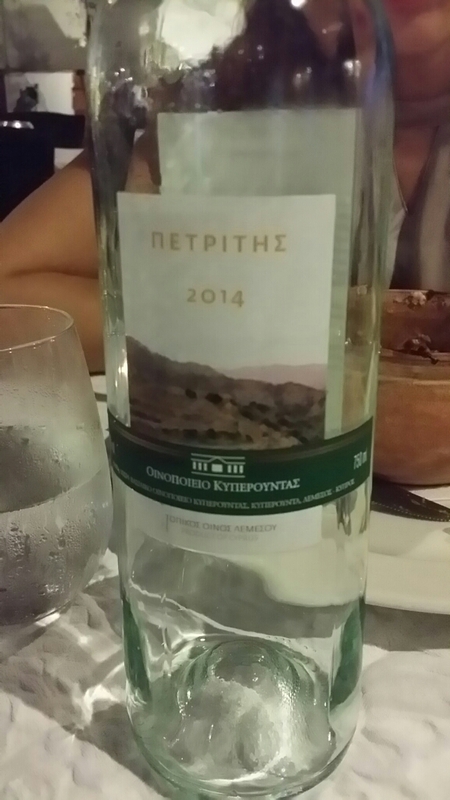 The wine wasn’t bad but we had much better ones for little more during our stay in Cyprus. Please note that the meat meze is an heavy dinner, salty and spicy, hence you might face a fierce thirst during the night. At the moment of the bill, we had a bad surprise. Wine, Meze and an appetizer costed us 54 Euro. Slightly less of what we would have paid if we had chosen to eat at Ficardo again, which in terms of quality of food and service is much much better. This entry was posted in Cyprus, Food, Holiday, Restaurant, Restaurant Review, Travel and tagged Cyprus, Food, food lovers, Foodaholic, halloumi, Paphos, tavern on July 7, 2015 by andreadetto. We explored the ancient ruins of Paphos, which include a medieval castle, houses of noblemen of the 2nd Century, ancient churches and tombs of the Kings. We started from our hotel at 10 am and we finished the tour at around 4 pm. As in every holiday, we stuffed ourselves as much as possible at breakfast, in order to have fuel enough to walk around without the need to stop for lunch after few moments. However, around 3 pm i was famished and had to grab some food. Close to the harboor and the main bus station, there is a lively streat with reataurants and pubs. Many of them were offering fresh fish, other were offering quick meals. We opted for Delicious, since it offered wraps and local sandwiches and other easy things. I ordered a Pork Suvlaki (literally pork skewers) and a pint of Keo (local beer) and my partner ordered a vegeterian sandwich. The Souvlaki came with pita bread, fries, salad and tzitzaki souce. It was great in taste and presentation and was very filling also because they served it with a good portion of fries. The Keo beer is also very good. The service is all right. We have received our drinks and meals in a reasonably quick time and enjoyed the attentivness of the staff. They were not very fluent in English though we managed to effectively communicate. After the massive meal, we had the brilliant idea to share a chocolate crepes. Please note that it is huge and can substitute a meal if you eat it alone. As digestive i took a Cypriot Coffee, a slight alteration of the Turkish coffee. The price was within a reasonable range since we paid 45 euro for the suvlaki, vegeterian sandwhich, crepes, water, beer and two mocktails. 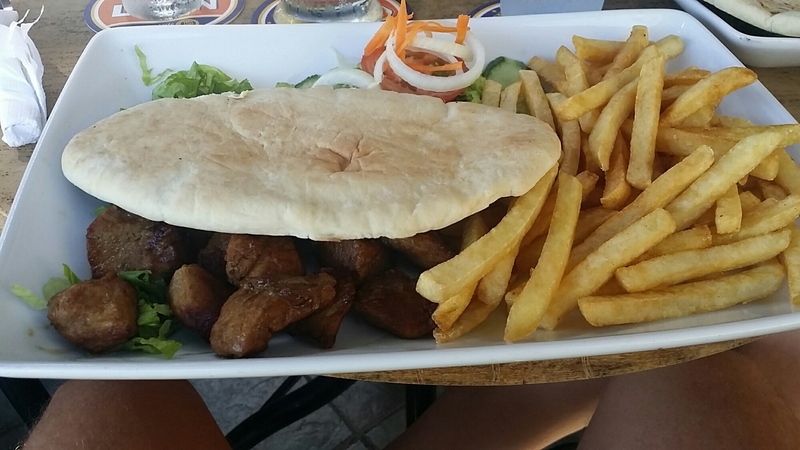 This entry was posted in Cyprus, Food, Restaurant, Restaurant Review, Travel and tagged Food, food lovers, Foodaholic, Keo Beer, Paphos, skewers, Suvlaki on July 5, 2015 by andreadetto. Since in Dubai it is very hot at the moment and the Holy month of Ramadan is ongoing, we have decided to concede ourselves a short break in Cyprus where to celebrate my partner birthday. Our holidays in Cyprus started in Paphos, an anciet city now UNESCO heritage centre. During our stay, we had dinner in Ficardo restaurant, one of the best in town. When we walked in, we were warmly welcomed by the hostess and the other people working in the venue. The menu offers many options starting from appetizers, soups and salads to desserts and coffee. We wanted to try the famous Cypriot Meat Meze but unfortunately we were told we had to book it a day in advance since it isn’t available on the spot. We decided then to have cypriot dips as starter and moussaka (minced meat with eggplants and bechamelle sauce) and Stifado (beef stew) as mains. The dips were tzatziki (yougurt with cucumber sauce), cypriot hummus (a bit spicy) and a pinkish cream we failed to understand what it was. My stifado was amazing with beef cutlets cooked at perfection, very tender and tasty. The dish comes with vegetable, a little steamed rice and fries. Just note that the mains are big enough to fill you up, hence do not exagerate with the starters. We were struggling to finish the mains after having had the simple dips to share. Petritis White Wine was excellent. commend a nice bottle of wine. He came back with a semi-dry but fruity wine called Petritis, a locally produced wine. Wonderful. It would have been better to enjoy it with some fish instead of a beef stew, but it was really excellent. The service was brilliant. Our waiter was extremely friendly and attentive. We had a very pleasant dinner. At the moment of the bill, we had a nice surprise: 45 Euro for two people with the quite expencive wine included (19 euro). If you are in Paphos, you should pay a visit to this restaurant. This entry was posted in Cyprus, Food, Holiday, Restaurant, Restaurant Review, Travel and tagged Cyprus, Food, food lovers, Foodaholic, Paphos, Stifado on July 4, 2015 by andreadetto.